Tarot Divination has long been used as a guide in the form of “imagery”. The study of Metaphysics and Tarot can be traced as far back as 469 BC to Socrates a Greek Philosopher who was known for his references to the “sign” or what we call “intuition” which he characterized as “a phenomenon” whose origin was divine, mysterious and independent of his own thoughts – “divine” inspiration that gave him, and people like him, access to higher insights about reality. The term Metaphysics (meta=”after” physics) or “beyond the physical” was associated with Aristotle, a Greek Philosopher, in his writings about his teacher Plato who was a student of Socrates. He referred to Metaphysics as “first philosophy” or “the theologic science”. His work “Metaphysics” is considered to be one of the greatest philosophical works and was the beginning of works which are known as “Aristotle’s Metaphysics”. The Middle Books (Zeta, Eta and Theta) are considered the “core” of Metaphysics. Aristotle counseled Alexander the Great and two other future Kings – Ptolemy & Cassander with the use of his metaphysical symbolism. In my studies I came across an old manuscript “Meditations on the Tarot: A Journey into Christian Hermeticism” – originally published anonymously – so that the works could “speak for themselves”. Data from this manuscript began my 13 year effort to incorporate the works of the many Masters of Tarot into one powerful source which could be used by the Reader to develop their own personal understanding of the meanings of the cards – using the various references as a guide. “Energy” is the focus of Crystal Clear Reflection Tarot Divinations. The energy we carry with us from past experiences is stored in our subconscious mind as a memory. This energy regenerates itself as a “feeling” any time a current situation begins to reveal “signs or flags” which are similar to a past experience. These feelings convey an important message for those who are willing to listen – they are “red or green lights” helping us to choose how we wish to proceed in current situations. As we come to know and become familiar with our own energy – we begin to connect to the energy that surrounds us – we learn to distinguish between our own energy and the energy of someone entering our “space”. This awareness helps us determine our response. The TAROT cards provide a “picture” of the energy surrounding your situation – a picture which views your situation from different perspectives – helping you to “see” things in a new light. I am using the imagery from the Waite-Rider Tarot Deck because the images are very simple, while the details and backgrounds hold a wealth of symbolism. 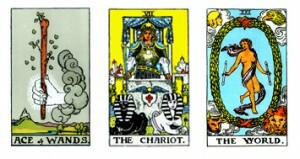 Some text and the “Special Messages” sections were derived from the Karmic Tarot, by William C. Lammey. Some text and the “Questions to Answer” section was derived from works by Mary K. Greer, a Grandmaster of the American Tarot. It is my hopes that this information will assist you on your Journey! Here’s How it Works … you can view the postings without becoming a member, however – if you wish to post a question / idea or respond to a posting, you will need to become a member. Becoming a member is free and requires only that you provide your name and email, then select a password for logging in. As a member, you can post a questions / ideas or respond to a posting. To protect the site and prevent spam / link fraud / advertising / postings in bad form – no posting will be made “viewable” until it has been approved by the site administrator (which can take up to 24 hours). You can select a specific area on the top, by clicking on the “down” arrow and selecting the area you wish to view. Then you can view all the feeds for that area. If you want to respond to a posting, you will need to click on the highlighted area which will show the specific post and includes a response area for you to type in.